We always run our trips with 2 adults per sled (one driving the sled; the other riding in the sled enclosure), or 1 adult driving 1-2 children. Our adult guests (age 15 and older, weighing at least 100 pounds) are eligible to take turns driving the sled and riding in its enclosure. Contact us for trip start times, as they vary throughout the season. 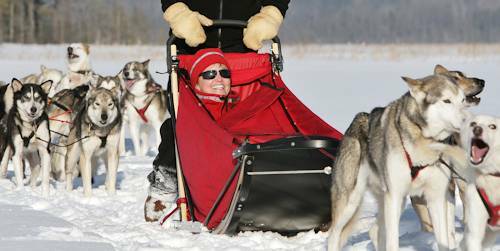 No previous dogsledding experience is necessary for any of our trips! We never pair members of different parties together on one sled; you will be paired with a member of your own group, or with one of our guides. Each sled’s driver/rider configuration is determined in advance of your trip by our head guides, based on multiple factors, including, but not limited to, the accurate age, height, weight, and fitness level information that you provide to us. The stated time-on-trail of each trip is subject to slight variation, depending on weather, trail conditions, and group size. Prices quoted are all-inclusive, with the exception of tips/gratuities (which are much appreciated by our hard-working staff! ), and Chilly Dogs T-shirts and other apparel and souvenirs from our Gift Shop. Mushing a team of sled dogs requires that participants be in fairly good physical condition, able to jog beside the sled—always holding on to the handlebar—while ascending the hills along the trail. We do our best to accommodate people with physical limitations. Please contact us to discuss the specific needs of your party members. Our most popular trip! Suitable for ALL ages and multiple fitness levels. Certain weight restrictions apply. This more challenging trip requires a higher fitness level; it is perfect for active outdoor enthusiasts. Certain weight restrictions apply. $325 per adult age 15 and up; $250 per youth age 10-14; $205 per youth age 9 and under; Minimum 2-adult rate of $650 per trip If you are looking for the equivalent of a full day of dog sledding, and you have a higher fitness level, then this trip might be for you. A combination of our Backcountry Loop and our Snowy Owl Run, this trip option will provide you with as many, or more, miles on the trail than most typical day trips. You'll enjoy the longer morning run, a mid-day break for lunch in town or at your cabin or lodge, and then come back for a shorter afternoon run to complete your full day of dog sledding. Certain weight restrictions apply..
We custom-design dog sled programs for larger parties such as elementary and high school groups, college groups, Boy Scouts and Girl Scouts, church groups, bridal parties, corporate groups, and other organizations. 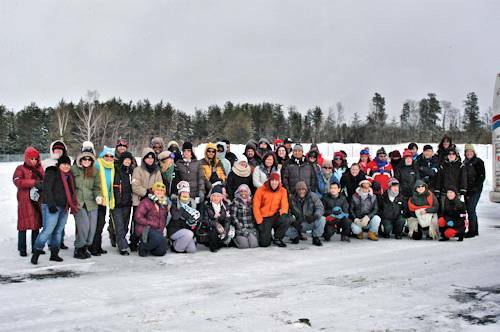 Give us a call and let us propose a dog sledding adventure for your group! $100 for 1-6 people. Groups of 7 people or more, please call for price. In all four seasons, guests may come visit us here and see what a kennel of working dogs looks like. We take you into our kennel to meet our fun, friendly Alaskan huskies and just "hang out" with them, while you learn about the breed and the work they love so much—running and pulling sleds over snow-packed trails. We'll show you the sleds, equipment, and techniques used in the sport; share some stories of dog sledding lore; and demonstrate some of the clothing and gear used for dogsledding. Subject to availability. October through mid-December. This option is the same as the Kennel Tours, but with the additional thrill of actually going on a training run with a large team of dogs, while riding in the comfort of a Polaris Ranger.